Respect - Equality - Advocacy - Empowerment! 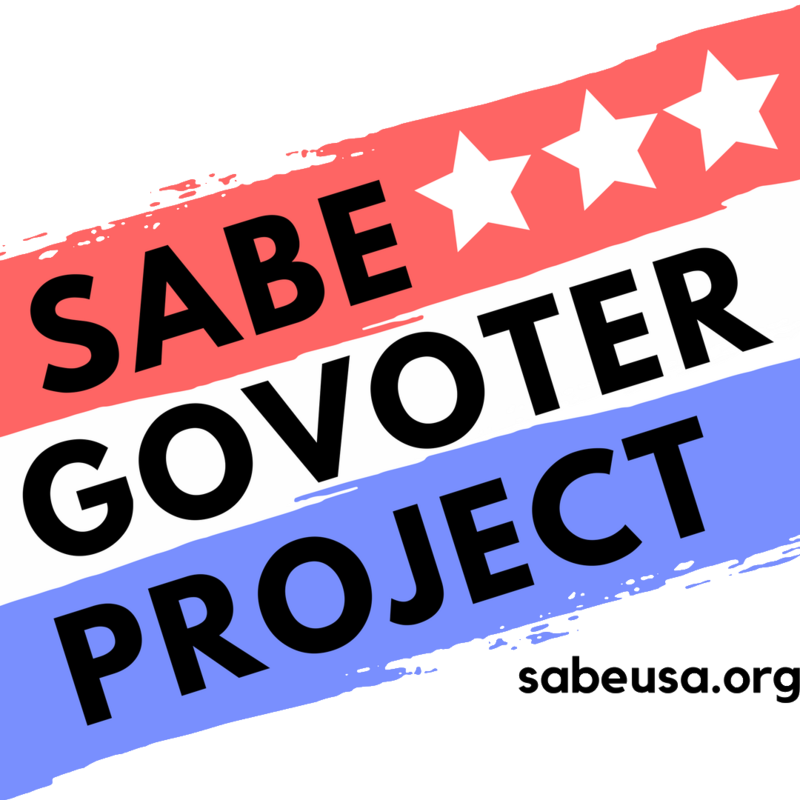 The SABE GoVoter Project is investigating issues around voting for people with disabilities. We are asking these questions about the November 6, 2018 government elections not your self advocacy groups or organizations elections. You do not have to complete this survey or answer any questions. If you choose to answer, it will help us learn about your voting experience and how we can make it better. We do not ask for your name so no one else will know what you said on the survey. In our report we will only share the city and state you live in. If you have more questions about your privacy please contact Essie Pederson, Essie.pederson@gmail.com . You can complete this survey on-line or on paper copy. 1. You can go on-line at the Self Advocates Becoming Empowered (SABE) website, www.sabeusa.org and click on “SABE GoVoter Survey”. If you have any problems getting to the survey there contact Juliana Huereña at j.juerena@swifamilies.org or (602) 502-7426. 2. You can go to your state Protection and Advocacy (P&A) organization’s website and click on the “SABE GoVoter Survey”. If you have any problems finding the survey there contact Juliana Huereña at j.juerena@swifamilies.org or (602) 502-7426. 3. You can do the survey with other self advocates at your Self Advocacy Group Meeting. Call the President of your local self advocacy group and ask for help completing the survey at the meeting. 4. You can ask for a paper copy of the survey by contacting your state P&A or Juliana Huereña at j.juerena@swifamilies.org or (602) 502-7426 for a paper copy of the survey. 5. You can call a SABE GoVoter Team Member and ask them to help you with the survey. Call Teresa Moore at (602) 725-3117 or mooreadvocacy@hotmail.com . Paper surveys must be mailed to Essie Pederson, 5242 Sunrise View Circle, Liberty Township, OH 45044 or emailed to Essie.pederson@gmail.com . The survey deadline is January 1, 2019. Just as it is important to know that YOUR VOTE COUNTS, we need to know that you have the accessibility you need to MAKE IT COUNT! We Believe that all people with disabilities should be treated as equal and be able to speak up for what they want by serving as leaders and working together as a team with all members of the community. People First of Ohio assists people with disabilities who are self-advocates to talk about their needs and rights with people in their communities. Self-advocates make sure that people with disabilities have the right to do what they want in their lives, are responsible for their own choices , and have the right to live and do things in the community like other citizens. People First began in Ohio in 1998 by a group of self-advocates who wanted to improve their abilities to represent themselves and to train others to be self-advocates. People First of Ohio has members from teens through adults. People First of Ohio is a statewide organization that works with state legislators and builds relationships with other advocacy groups and state agencies. These relationships promote better interaction among people who make decisions in the communities and the state. People First believes that if policymakers begin to really know people with disabilities, they will be able to make positive changes for them. People First of Ohio helps to set up local chapters of people with disabilities who are self-advocates. The chapters focus on helping others with disabilities become self-advocates. Local Chapters work mostly on local issues. Leaders of People First of Ohio are themselves people with disabilities. Board members must belong to a People First Chapter in Ohio or be a paid member at large with one year experience. I may not be able to look into the future, but based on my past, the future looks bright for me, thanks to People First of Ohio, for giving me the opportunity to expand my wings.